Since 2013 (2009 actually!) 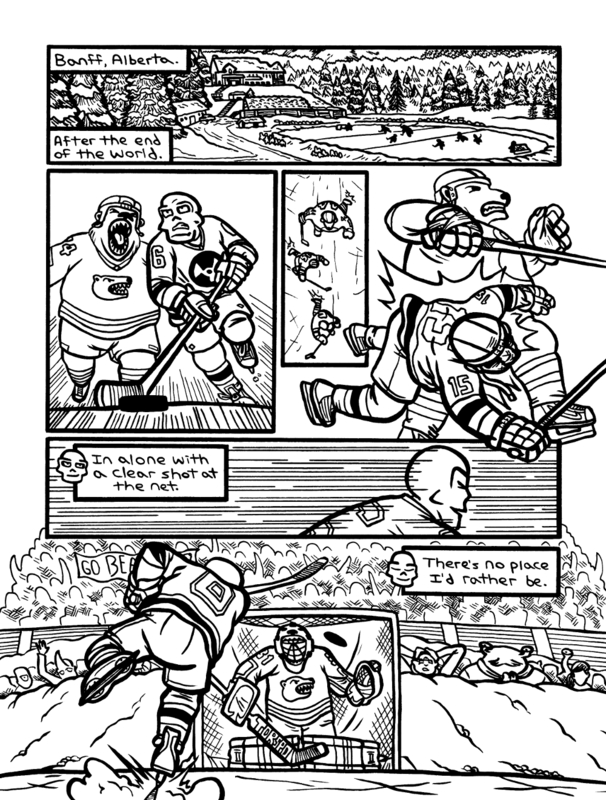 Jeff Martin has been creating the world of ‘Hockeypocalypse’. A world that mixes Hockey, Canada, and Postapocalyptic madness into one sitting! 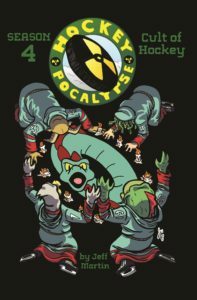 And with his recent Kickstarter for his fourth graphic novel in the series known as ‘Cult of Hockey‘, a little sit down with Jeff was needed to pick his mind about the 4th GN and the series over all. So if you’re ready, read on to see what he had to say! 1. Hello there, and welcome to the Mind Meld! Now, for those who may not be too familiar with your work, could you tell us a bit about yourself? Thanks for having me! 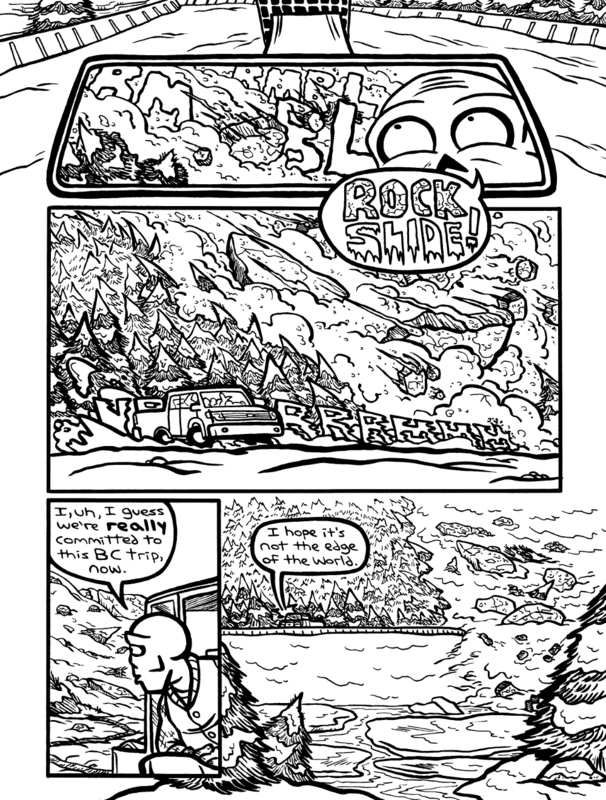 I’m a cartoonist from Edmonton, Alberta, and I’ve been working full time in comics since 2013. 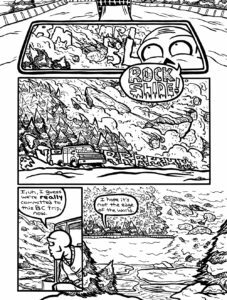 Most people probably aren’t that familiar with my work – I’ve found myself in a unique situation where I’ve been able to engineer a living out of comics, but really don’t have a ton of visibility or a huge audience. If you jump on opportunities to get out in front of potential readers and show off your work, you can get by without being good at being popular on the internet, or having the platform offered by large publishers. 2. 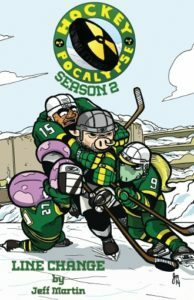 In 2013, you created the world of ‘Hockeypocalypse‘ and are currently running a Kickstarter for the 4th graphic novel known as ‘Cult of Hockey‘. And I’m sure some might be wondering, what led you to deciding to combine a postapocalyptic world with Hockey and have it set in Canada? Which, admittedly is nice to see since most postapocalyptic worlds are in America. Hockeypocalypse predates even the 2013 release of the 1st Period – the story that became the Season 1 graphic novel was originally written in 2009, and had about 40 pages drawn. 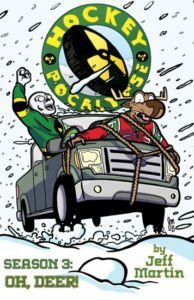 It was pitched to a bunch of different hockey teams/publications and comic publishers, but eventually that fizzled out and I shelved it for a few years. 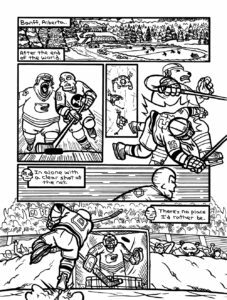 Synthesizing the post-apocalypse with hockey came from a desire to tell a hockey story mixed with an interest in drawing monsters. A post-apocalyspe setting gave me the ability to explain away any kind of wild character design choice with “they’re mutants,” because if Stan Lee has taught us anything, it’s that most people will just accept grossly inaccurate science if you make the end result fun. Once I had the basic premise, using Canada as the setting was a no-brainer. I’m Canadian, and Canada is the only place where people care enough about hockey to use it as ritual warfare instead of resorting to, y’know, ACTUAL warfare. I wouldn’t be surprised if some Minnesotans make an appearance at some point, though. They’re hockey-mad too. 3. Each book features a self-contained story and the 4th in the series will be no different. Making it easy for new readers to jump in without much of a problem. Was this something you thought was for the best? Rather then one long continuous storyline that spanned several graphic novels? I think long, sprawling epics are tremendously overrated. I wanted to tell concise stories that didn’t need a ton of context or reliance on readers having pre-established knowledge. Most people will buy the first volume first, because numbers, but I wanted to make the books as easy as possible to get into without readers needing to worry about getting them in the right order. Now that I think about it, I’m kind of wondering if that came from the influence of Scholastic books like Goosebumps that I read as a kid. That’s not dissimilar to the approach I’m going for, Hockeypocalypse just has the same characters in each book instead of being wholly separate. 4. When you first began, did you think you’d still be doing the world of ‘Hockeypocalypse‘ by 2018? Or have much of an audience? 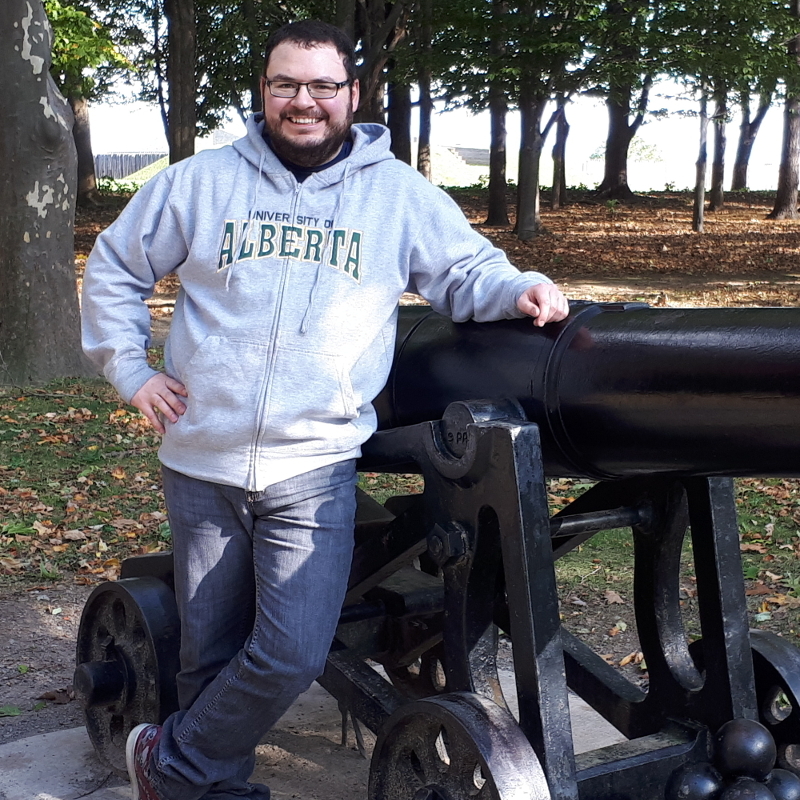 I thought it would be going because it had been sold to one of the several hockey teams or publications I approached early in the series’ life, not because I’d by-passed the traditional publishing industry entirely and was doing it myself. I’m a terrible judge of what will gain traction – stuff that I think could really get a foothold and turn into something big frequently underperforms, while other projects will be almost bafflingly successful. Audiences are always a tough thing to gauge, because they’re always bigger than you think they are, but never big enough. 5. 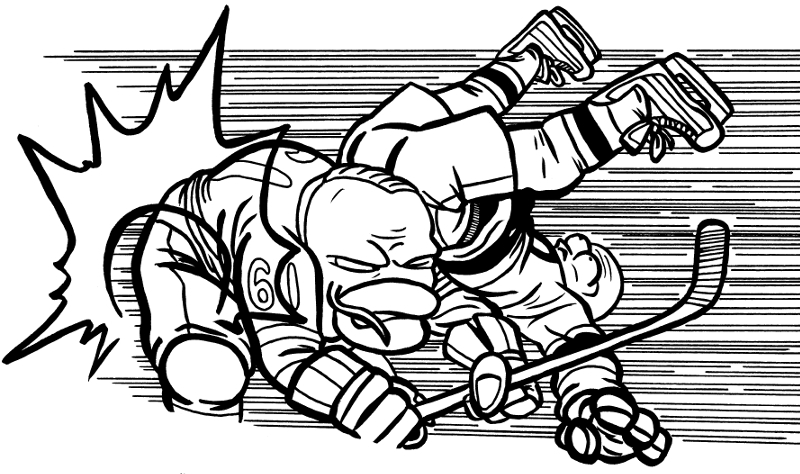 Can you tell us about a few of the characters that exist in ‘Hockeypocalypse‘? The key character interaction is the tension between Skully and Lizzy’s approaches to handling the way they gamble resources on their games – Skully’s frequently reckless confidence and bold decisions contrasted with Lizzy’s patient, more practical approach intended to limit losses and keep the community’s resources fairly steady. The series has a ton of characters, though, since everyone is showing up as part of a team. Squid, who’s part-mad-scientist, part-philosopher, part-sick-puck-handler, has been popular with readers. Lizzy taking over as the main character in the second season was also met with a lot of positivity. My favourite character to write, though, is the character I would like the least as a person – Boss Hog. He yells everything he says and his lines are always the crudest, most blunt approach he can take to communication. He’s also a ton of fun to draw – he’s like a refrigerator with limbs that zooms around the ice smashing into people and being way better than everyone else. I think that’s part of what makes him so useful as an antagonist – he’s a complete dickhead, but everyone also realizes that he’s better then them, and that makes it SO MUCH worse. 6. As you’ve mentioned on your Kickstarter for the 4th graphic novel, you’ve turned to Kickstarter for the 4th graphic novel. Primarily in order to expand your audience. Provided this is a success (and judging by the looks of things, it will be) will you use the platform again for future ‘Hockeypocalypse‘ stories? The campaign funded over a week ago at the time of writing, so I think it’s safe to say it’s going to be a success by that metric. I think taking a future book to Kickstarter is definitely something I’ll be pursuing – just the sheer number of new readers that have supported this campaign is motivation enough to make me excited about future volumes. I’m currently discussing a more horror-slanted take on the universe with artist Lukasz Kowalczuk (whose art you can see in the guest art gallery in ‘Cult of Hockey‘), which would release as a single issue, so maybe that will find it’s way to Kickstarter. 7. 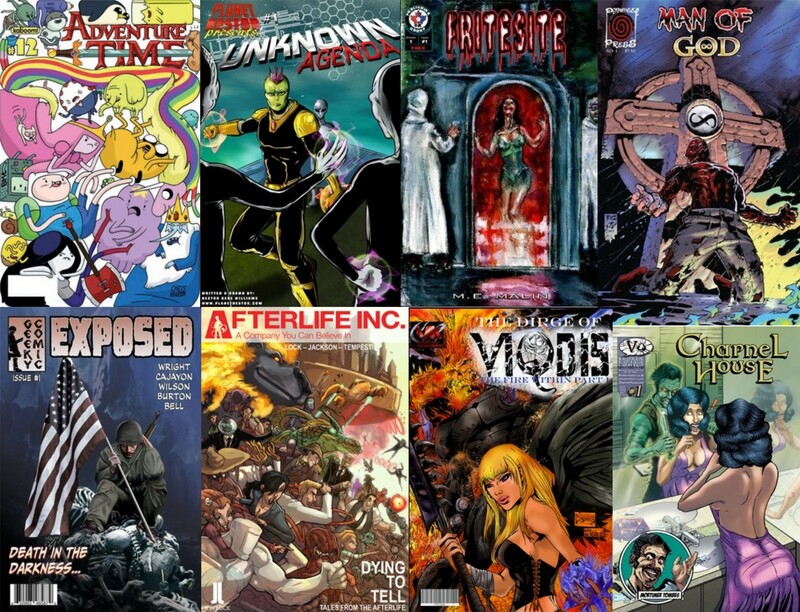 What can readers expect for the 4th GN? And how will events from it affect further stories? They can expect a fast-paced, energetic, entertaining story full of action and heart. We’re also going to see a lot of new parts of the world, particularly the Rocky Mountains and the Okanagan valley. Oh, and did I mention Ogopogo? Yeah, Ogopogo is in there, too. The biggest effect is going to be the expansion of the world – it’s only going to keep getting bigger from here. I think of it something like the expansion of the NHL from the Original Six to the larger league we see today; we’re going to see more teams, more mutant action, and more possibilities. 8. Of the entire series, what for you has been your most favorite moment? I think my favourite moment in the series is when Lizzy finally snaps on Boss Hog at the end of Season 2. I think that’s one of the most cathartic moments in the series. 9. Of the entire series, what for fans has been a most favorite moment? Anytime someone tells me about their favourite moment, it’s usually based on whichever character they find themselves connecting with most. 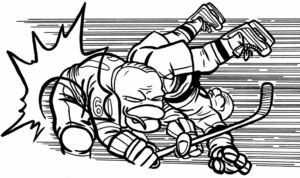 I feel like the closest thing to a consensus favourite moment would be finding out that the series exists in the first place – I love watching people’s faces light up when they realize that a hockey comic exists. 10. 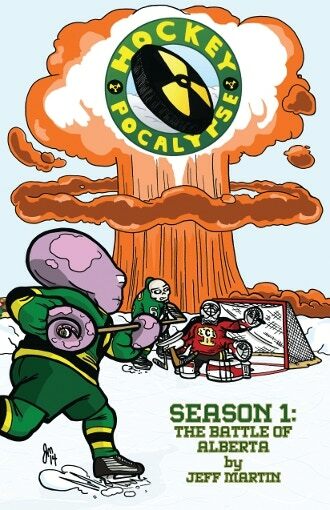 As has been mentioned, you’ve sold many a copy of ‘Hockeypocalypse‘ in person at conventions, schools, and libraries. Would you say this has hurt you somewhat when it comes to online promotion? As the campaign goes on, I’m learning that it might not have hurt online promotion, but it absolutely doesn’t help. I’ve found it harder to galvanize the audience that’s used to buying from me in person than I expected – I think a lot of them are taking the stance that it’s funded, they’ll buy it from me in person later. Which will be great later, but also really hurts the ability of the campaign to maintain momentum. I’ve never felt comfortable with online promotion – some people seem to really thrive online, but the amount of their time and energy that’s spent online is something I can’t handle. I’ve always been someone who’s way more comfortable with my thoughts existing mostly in my own head, and keeping to myself, so the importance of being popular online in modern marketing is something that’s always been a huge challenge for me. I don’t want to be a brand, I just want to make stuff and have people read it. That seems to not be an option unless you fluke into a major hit. 11. If there was anything you could go back and do differently where ‘Hockeypocalypse‘ or any other title of yours is concerned, would you? I think the biggest change I would make would be in season 1 – if I had to do it over again, I’d develop a B story for Lizzy to give her more to do. She wasn’t as fleshed out then as she would become later, so a secondary story would have helped with that, I think. 12. And finally, what advice would you give to those who are looking to get into comics creating or are just getting started? Make stuff. Make a lot of stuff. Every other piece of advice that anybody will give you about comics uses that as a base. Networking, skill development, all of that stuff is meaningless unless you’ve got a body of work that you can show people. Many thanks to Jeff for taking part in this interview! Currently, Hockeypocalypse: Cult of Hockey has 8 days left to go so do be sure to donate to the Kickstarter before time runs out!